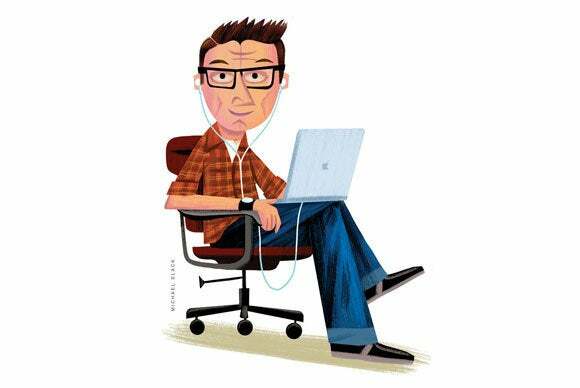 Ask the iTunes Guy: When is it better to store apps and music in the cloud? Recent news is dominated by the iPhone 6 and iOS 8, but not everything in the Apple universe revolves around its latest releases. I have three burning questions in this week’s column that may interest iTunes users regardless of which devices they use. I look at a question about deleting all the apps in an iTunes library, discuss setting up iTunes Match and then deleting all your locally stored music, and look at a way to catch up on old episodes of podcasts. Should I delete all my apps? Q: I’m considering deleting all the apps from my iTunes library and removing the huge Mobile Applications folder in my iTunes Media folder. That folder and its contents take up a whopping 22 GB and I can’t see the point of having it around. If I want to add an app that I’ve already purchased, I search for it on the App Store or go to the Purchased tab. I never sync apps through iTunes and I only update apps in iTunes occasionally. As the iTunes Guy, what do you think? After receiving this question, I checked my Mobile Applications folder—that’s where iTunes stores iOS apps—and, at 24 GB, found it was even larger than yours. But there’s no way I’m going to delete it. The main factor to consider here is your Internet bandwidth. I have a pokey 2 Mbps connection (plus a faster satellite connection, but which has a monthly quota), so while you may be able to re-download apps quickly, I can’t. If you have so much bandwidth that it’s not an issue, then, by all means, save the disk space (especially if you’re using a Mac with low-capacity SSD). If your Internet speed is moderate but not outstanding, you should also consider the number of devices you use. I have four iOS devices: an iPhone 5s (soon to be replaced by an iPhone 6), an iPad Air, an iPad mini, and an iPod touch. Downloading one copy of an app in iTunes allows me to sync it to all four devices. Downloading it to all these devices takes time. Most people don’t have four iOS devices, but even if you have two, you may want to think carefully about how much time you can save by having apps in iTunes and then syncing. Finally, there’s the out-of-sight-out-of-mind principle. It’s easy to obtain apps and delete them from your device because you need the extra space or their features don’t currently interest you. If you interact with the App Store only on your iOS device, you might forget these apps entirely. Keep them in iTunes and you have the option to browse and update everything you’ve ever purchased. An app's particularly beneficial update may compel you to give it a second look. How can I delete all my music and use iTunes Match? Q: I want to subscribe to iTunes Match and delete all the music from my iTunes library. Can you tell me the best way to do this? First of all, I’d strongly recommend keeping the music in your iTunes library somewhere—either on your Mac or within a backup on another drive. I suggest this because there have been many cases where iTunes Match serves files that are poorly mastered or match different tracks (a live version versus a studio version, for example) or bad tracks. You may end up matching your music, deleting it, and finding that you can’t get all the tracks you once had (or receive tracks of poorer quality). Also, there are certain types of tracks that iTunes Match won’t match. These are tracks whose quality is too low (below 96 kbps) or are too large (bigger than 200 MB). So, you ideally want to match everything, then find all the tracks that didn’t match and save those files. Here’s how to do that. After you’ve gone through the iTunes Match process—which may take a while, depending on how much music you have—create a smart playlist in iTunes to find the tracks that didn’t sync for one reason or another. To do this, choose File > New > Smart Playlist, then set the first condition to iCloud Status is Ineligible. Click the plus (+) button to the right of this line and add another condition: iCloud Status is Local Only (this will find files that haven’t yet synced to iCloud). Finally, click the plus button again and add a third condition; iCloud Status is Error. These are tracks that, for some reason, weren’t able to sync. Click OK to save this smart playlist. You’ll now be able to, for example, drag all those tracks to a folder in the Finder if you want to save them. Or you can just keep them in your library. This smart playlist finds all the tracks that are now in the cloud. To find all the tracks that are now in the cloud, create a similar smart playlist as I’ve outlined with the conditions iCloud Status is Matched, iCloud Status is Purchased, and iCloud Status is Uploaded. You can now delete all the tracks in this playlist. All this said, I still recommend keeping a backup, just in case. Q: I’m catching up on some podcasts, and I’ve been using a Smart Playlist to sync five of the oldest episodes at a time to my iOS devices. The list selects the oldest first, with a limit of five, so I can eventually listen to all the episodes in the order they were created. I read that “My Stations” is the replacement for podcast playlists, but it looks like it lacks the functionality I need to catch up on the podcasts from oldest to newest. I say this because the “include” drop-down menu in the Station Settings only lets me select “all” or the “X newest episodes.” Is there a way to reverse this logic so that it includes the “X oldest episodes”? 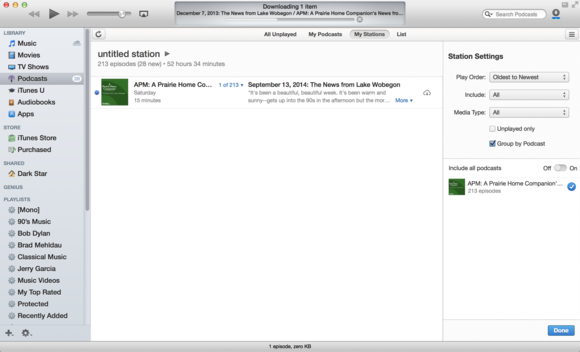 You can set a podcast station to play episodes in oldest-to-newest order. Alas, no. I listen to some podcasts like this, especially when I come across a new podcast that I like. The only workaround is to set up a podcast station with all the episodes and set the play order to Oldest to Newest. The problem with this, however, is that you may have lots of episodes synced to your devices. What I would do is not download too many of the episodes. Instead, start with the oldest ones and download, say, ten at a time, so they don’t fill up your devices.